A new cover, a nice price for a classic! 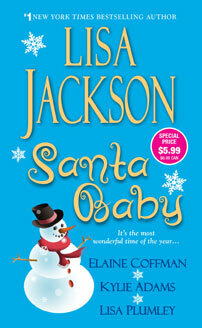 SANTA BABY is being republished and will be exclusively available at WalMart!!! Look for it October 4th, 2011! It’s a time for family and friends, giving and receiving, and just possibly, true love. This book contains previously published stories including "A Baby for Christmas" by Lisa Jackson, "Under the Mistletoe" by Elaine Coffman, "Holiday Stud" by Kylie Adams, and "Merry, Merry Mischief" by Lisa Plumley.